The decision to quit wasn’t easy and it didn’t happen on the first try. This app kept me focused on the positive. It’s nice to see my progress and I like the push notifications. They kind of remind me of my success while I’m busy going about my day. I didn’t really like talking about it to other people so it was nice to have the “quit coach” to kind of “talk to”. Thank you. It’s been 12 days for me and it’s super fun to look forward to things and track my progress. I love having the counters (days smoke free, money saved, etc.) and seeing small health improvements. The trigger feature is interesting but I only tend to remember to note big ones. I could see the wishlist feature being useful for some, as well as the diary, but not for me. Some missions are very helpful, while others not so much. The only reason I’m giving it 4 stars is the quit coach feature doesn’t load for me half the time. All in all, it’s a great app and I paid the one time fee just to support it really. What’s offered for free is extremely helpful all on its own. I love this app. 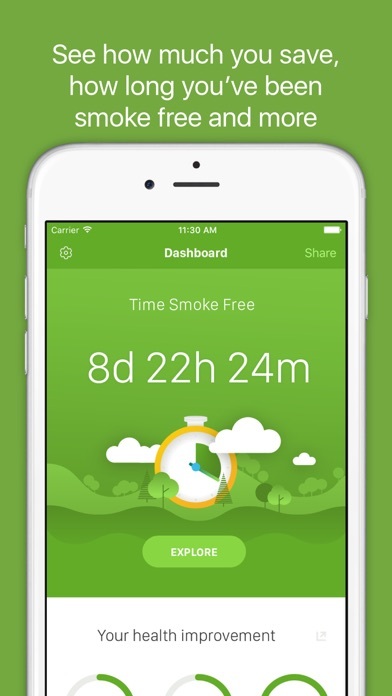 My husband still smokes, but this app helped me quit even with my husband smoking around me. If nothing else it gives you something productive to use/do during those god awful urges. 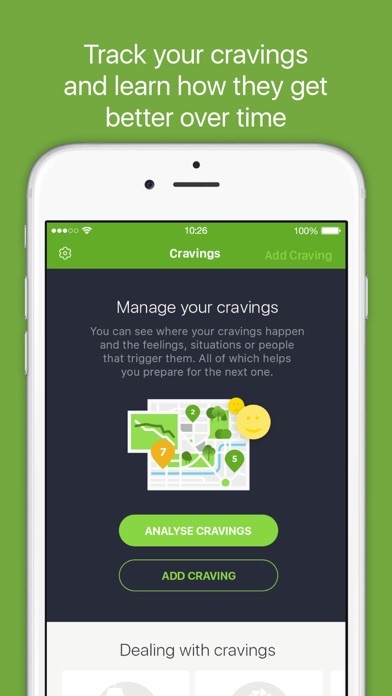 Your one step closer to quitting, try this app. I love the ‘assignments’ this app offers. It’s a great cognitive approach to quitting. 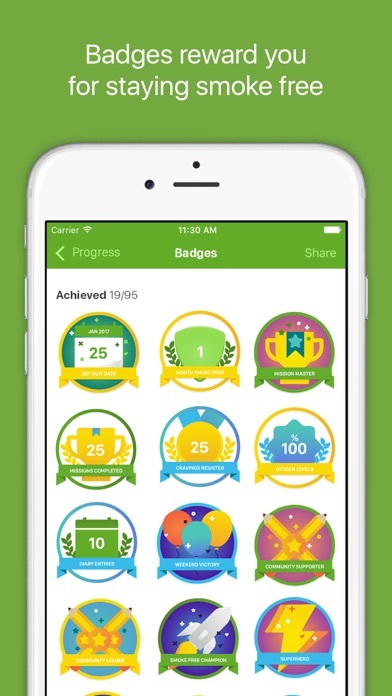 Also, the app offers so much positive reinforcement to quit! 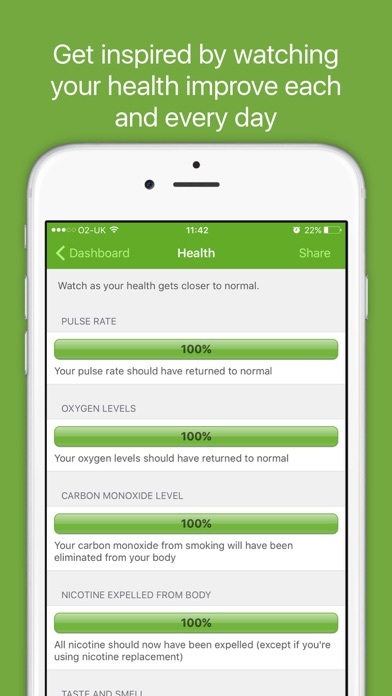 It monitors your cravings, health progress, and tracks how long you have gone without smoking, how much money you save, and other aspects of quitting smoking. It is amazing and has helped me tremendously! I love that this app goes the extra mile in supporting one through such a difficult task. Quitting smoking is so hard and the missions, the diaries, it all helps with mindfulness. 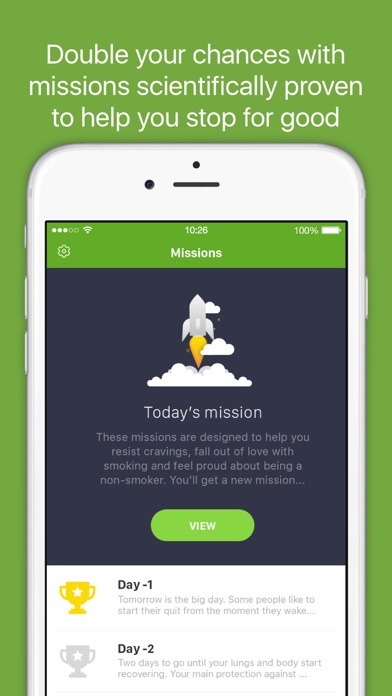 For me, smoking is the opposite of being mindful so this app is just a great help in shifting that. Truthfully, I have tried to quit smoking many times. Finally, after 20 plus years, I have, with the help of this app! This is the truth! This app is very helpful reminding you what steps to take, what money we’re saving, etc... Just very helpful and motivating.